"Justice – Peace – Work"
IRiphabliki Labantu weKongo izwe eAfrika. Kukhona amazwe amabili abizwe ngemfula 'Congo'; iRiphabliki weKongo, noRiphabliki wentando yeningi yeKongo. ↑ Central Intelligence Agency (2011). 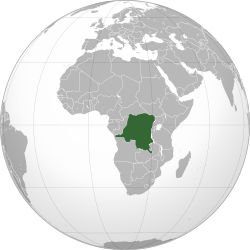 "Congo, Democratic Republic of the". The World Factbook. Langley, Virginia: Central Intelligence Agency. https://www.cia.gov/library/publications/the-world-factbook/geos/cg.html. Retrieved 5 October 2011. This page was last edited on 6 uZibandlela 2017, at 19:42.